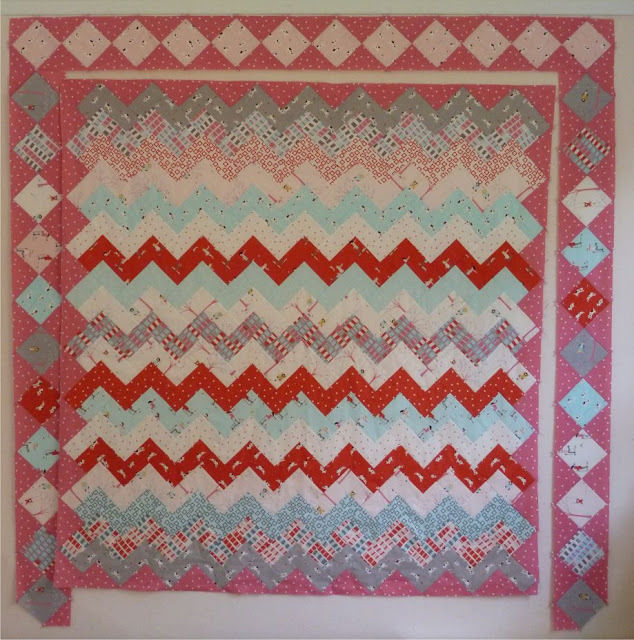 alidiza: WIP Wednesday - a quiltastrophe! WIP Wednesday - a quiltastrophe! I was so NOT going to show you this but it's been awhile since I've posted and I think people like seeing the bloopers of quilts gone wrong. Way back in May I showed you my Sherbet Pips zig-zag. The rows were all completed but I wanted to add some borders to make it fit Audrey's full-sized bed. Time passed, I worked on some other things, it was summer and the kids needed to be entertained... in the back of my head a vision for these borders was coming together and this week I finally put it in motion. Hopefully you can see where I was trying to go with this. I wanted a thin white inner border to stop the zig-zag and then the on-point diamonds would be offset to mimic the zig-zag. On the top and right I've almost got it right. I did so much math and really thought I had it! Unfortunately I was doomed from the start! For this to work the sides would need to match but I start with a zig and end with a zag. Sigh! Now it's back to the drawing board. The easy way out is to just quilt the zig-zags and have another throw. I can even make a second throw with the borders: set them all horizontally with some wide stripes in between. For now it's back to the WIP pile while I wait for another flash of inspiration. oof - I totally see where you were trying to go. I've been staring at it trying to find a solution (other than picking apart the top & removing the last zag), but nothing useful is coming to me. Unless you insert a wider inner border (maybe picking up the light blue, like thin white, thicker light blue, thin white) then putting your outer border on without trying to line up zigs and diamonds. This would necessitate reworking your outer border though, to make it bigger. Sorry - not much help! But the original idea is awesome! hunh? what's the prob, lady? i think it looks amazing! remember caro's saying, "if you can't see if from a horse, it's not a problem"?? i'm sitting on a horse.